pet parents who love them. We are excited to be here in the Dallas/Fort Worth area to cater to your canine and feline family members! Our state-of-the-art, 25,000 square foot resort is located at DFW International Airport and is here to provide the highest level of care to the pets of the Dallas/Fort Worth area. With a Boarding Lounge(TM) located near Dallas Love Field, we have traveling pet parents covered. 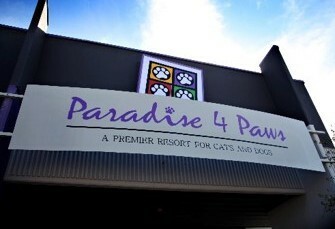 Paradise 4 Paws is staffed 24/7/365 so pets can be picked up and dropped off any time, day or night. Our lobby is open from 7am to 7pm for walk-ins, tours, and general inquiries. For more information, please see our FAQs. Call for more information on our Boarding Lounge™ located near Dallas Love Field. Click here to learn more about Pooch Hotel.